The Cartoon Couch: Cosmic Quantum Ray | TWINSANITY! It’s time for another installment of The Cartoon Couch. 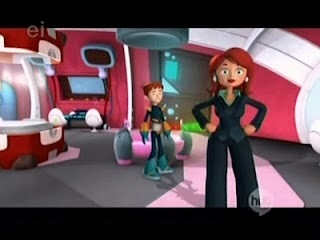 Today we look at one of the first shows to air on The Hub, the science themed animated sci-fi comedy Cosmic Quantum Ray. 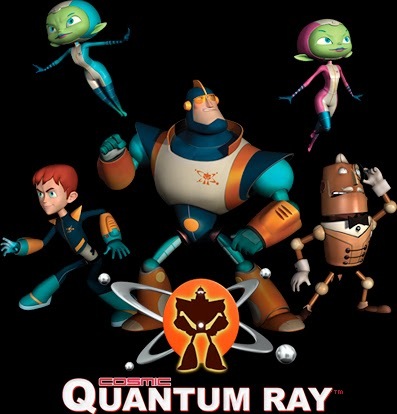 Cosmic Quantum Ray premiered on October 10, 2010 on Hub Network, and ended on December 9, 2010 with 26 episodes. It was produced by Moonscoop, Mike Young Productions, Method Films, and Telegael Torenta. The series had reruns on The Hub until November 4, 2013. Although produced by Germany’s KI.KA and France’s M6, the show was written in English, the writing supervised by Head Writers/Co-producers and Emmy winners Pamela Hickey and Dennys McCoy. 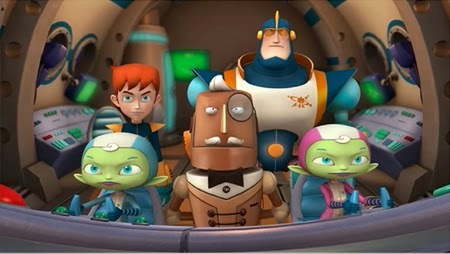 In 2009, the series beat out Nickelodeon, Disney and Cartoon Network to win the Pulcinella Award for BEST TV SERIES. The series was created by cosmologist Dr. Mani Bhaumik. Hickey and McCoy based all their stories on principles and theories from quantum physics, with Dr. Bhaumik literally providing the math. Cosmic Quantum Ray was billed as a bizarre comedy/sci-fi adventure (emphasis on “bizarre comedy”) that, at the end of each episode, explained the quantum physics associated with a story and/or physical gags found within the series. Atee and Geecee are a pair of super-cute pint-sized, green-skinned, pointy-eared, hovering teenage twin alien honeys from the planet Tooferwun –a planet where everyone is a twin (and you used to wonder where we came from) therefore they count as a single member of Team Quantum. Identical in appearance, the only way to tell them apart was by their costumes and demeanor: Atee, who wore a pink costume, was sweet-voiced and dainty, whereas Geecee, who wore a baby blue costume, was gravelly voiced and scrappy. The twins were the lead-footed pilots of the ship, knowing only 2 speeds: fast and faster. They were also lazy, declining to perform any other duties with their line, “We’re pilots. We don’t do (whatever additional task they were asked to perform).” In addition to the ability to hover and fly (the twins are seen floating more often than walking), the twins have a superpower that only works when they combine their bodies together to form “Double Helix” – a large band of super-strong, super-elastic DNA that can catch, launch or catapult villains, dangerous objects (like out of control meteorites) – or even their fellow teammates. The twins generate their “Double Helix” ability through the soles of their feet as a sort of contrail, and they control the helixes by flying around. The twins’ “Double Helix” power is activated when they touch each other and speak the phrase, “Two for one, we’re double fun! We’re Double Helix!” (It was unclear if this phrase was necessary or just a habit of theirs. Physical contact, however, is required. If the two are out of reach of each other, they are unable to activate their power.) Their one weakness is separation. They are “connected” on a quantum level…should they be separated they would be powerless. And if they are separated for a very long period of time… they could cease to exist as we know them (but being quantum, we’re not quite sure what they would become). Being teenagers, Atee and Geecee seemed to have a mild crush on Robbie, they were definitely ga-ga over his hair, as they tried to touch it, snip it or sample it in just about every episode. Their names didn’t just sound science fiction-y, they were also a reference to the components of a DNA molecule: Adenine Thymine (Atee) and Guanine Cytosine (Geecee). Bucketworth was a bronze plated sentient robot and the brains of the team. Luminously intelligent, educated and refined, he was designed with a mustache, bow tie and a monocle from which he could project holographic images. Bucketworth acted as the sarcastic Mr. Spock to Ray’s clueless captain Kirk. While he possessed no super powers (beyond being a self-aware robot) he possessed a genius level IQ, and could invent handy devices and impeccable strategies to win the day. Bucketworth also delivered the science lessons at the conclusion of each episode. Ever the refined gentleman, he always referred to Robbie as ‘Robert’ and Ray as ‘Raymond’. Robbie Shipton himself acted as Ray’s protege and the show’s audience avatar. He had no super powers, but provided common sense and oasis of calm within the group. While in ‘space hero’ mode, Robbie’s outfit switched to a snazzy navy blue and gold space suit with pointed shoulder blades and his glasses would mysteriously disappear. Robbie had another distinction: he was the only member of Team Quantum who had a secret identity. Robbie led the obligatory double life on Earth, and all of the episodes would somehow involve his high school and the usual string of colorful high-school characters: Lucas, the uptight overachieving nerd, Allison, the cute but annoyingly preachy vegan/animal rights activist, Scott Stotz, the jock jerk, Scott’s hulking goonish cronies Dustin and Justin, who never spoke but whose ‘dialogue’ usually consisted of them giggling like Beavis and Butthead, and Chip Monohan, the school mascot who never took off his squirrel costume (the show’s producers seemed to have a “thing” for squirrels, since a pair of squirrels were also among the show’s recurring villains). Chip also holds the distinction of being the only cast member outside of Team Quantum to have appeared in every episode of the series. So Robbie and crew had to spend many an episode making up hee-larious excuses for all of the bizarre events that went on around them, and the other kids just thought Robbie was a weirdo geek who made up loony space stories. Cosmic Quantum Ray wasn’t a bad show by any means; it was pretty fun, and I did learn some cool science stuff from it (it was from CQR that I learned what a quantum computer is, what qubits are and it’s what got me interested in string theory), but in short order, it did become a bit repetitive, what with the heroes facing the same revolving door of villains every time, and how each episode had to somehow involve Robbie’s school, invariably leading to another character discovering the truth about Robbie’s outer space escapades and exclaiming, “My gosh! Those stories you tell! They’re TRUE! !” only to get their memories erased (usually by Bucketworth) again and again and again. This happened so frequently that one episode even turned it into an in-universe joke. I would’ve liked to have seen a few episodes in which Robbie’s school chums were altogether missing, which took place completely in space and where they dealt with no villains at all; surely there were enough scienctific and astronomical themed disasters and anomalies which would’ve made for interesting stories without the constant need of a costumed antagonist and adherence to the standard “wash, rinse, repeat” formula. And I REALLY would’ve liked to have seen another character learn the truth about Team Quantum and NOT get their minds wiped at the end. I’ve never liked that “I am/have/can do something really cool, but have to keep it a secret from everybody” trope, especially when no reason is given for why everything must be a big secret. I can understand keeping the existence of aliens a secret from the feds; you don’t want your homies getting locked up and dissected (indeed, the gang did go to Area 51 in one episode and nearly met with such a fate), but I think you can at least let family and close friends in on it. I especially didn’t see why Robbie’s mom Debbie couldn’t have known about it; she actually found out about Team Quantum in 2 episodes, “What’s Up with Gravity?” and “Unreal Estate”, and each time she found out, she seemed okay with it, in fact at the end of the former episode she confides in her son that she really liked Team Quantum, so she obviously wasn’t going to blow the whistle on them, so why did she have to get her mind erased? You’d think having a parent in your corner would work to your advantage; she could cover for you when people start to ask why you keeping missing class or whatever. Not to mention Debbie got her Crowning Moment of Awesome in her first appearance by stating that she’d totally mess up any villain who screwed with her kid, and later does it! any lady who can pull a villain’s lower up over her head–literally!–is A-OK in my book. ← Why Spike is Awesome!